Though Rolex rarely officially collaborates on projects with outside companies, some individual dealers have customized particular Rolex watches and are offering them as unique pieces. 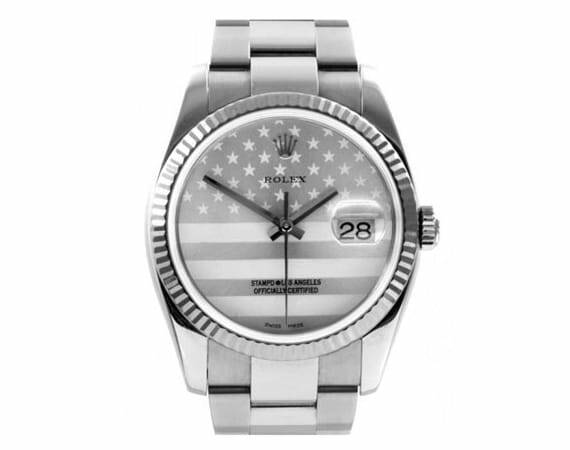 To celebrate the 4th of July, we are offering a few stunning examples of patriotic Rolex watches. Each watch has been specially customized to represent the patriotic spirit of the United States of America. 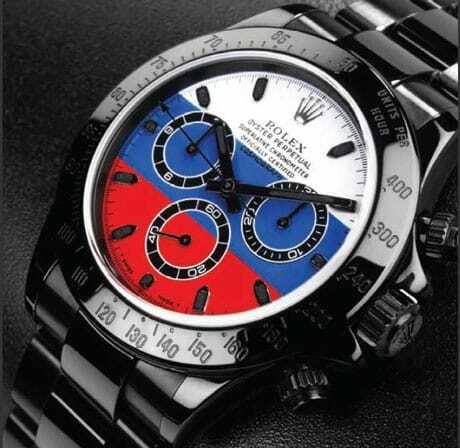 Occasionally, dealers will customize Rolex watches before selling them, offering their own unique touch. Made of 18k white gold with a fluted bezel and Oyster bracelet, the “Rolex Stamp’d” watch is a rare treasure. Stamp’d LA in Los Angeles has worked closely with Swiss-Signatures, an official dealer for Rolex watches, to create an exclusive, unique, and limited edition version of the Rolex Oyster Perpetual Datejust watch. The watch features a monochromatic American flag over the entire face. Though subtly, it has a true air of patriotism and class. This rare watch has been limited to a total of ten worldwide and retails around $15,000 USD. Bamford & Sons are another dealer who enjoy customizing Rolex watches. Their Bamford PVD Cosmograph Daytona Rolex ref. 116520 is a sleek, self-winding, perpetual motion, water resistant watch. Made of Rolex’s unbeatable stainless steel, the Bamford Rolex Daytona is PVD coated for extra protection. Bamford & Sons are some of the first dealers to use PVD coating. The PVD coating adds a professional appearance to the timepiece and virtually eliminates any reflective glare. The case back is engraved with Bamford & Sons while the dial, case, and movement are signed by Rolex. Highly customizable, Bamford & Sons initially released a stunning version of the Daytona ref. 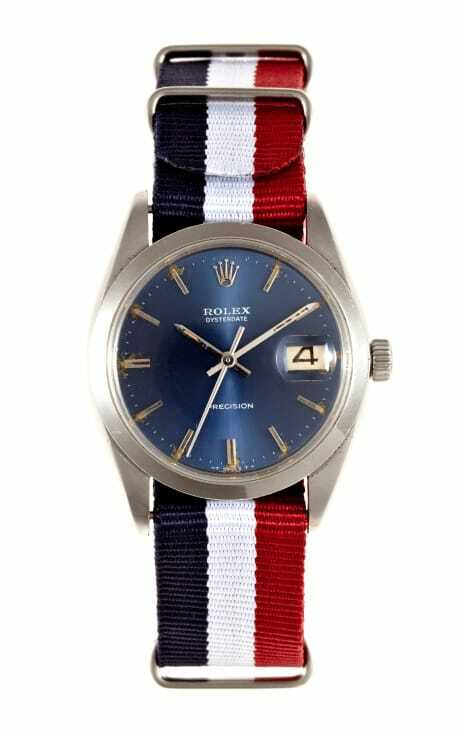 116520 with a patriotic white, blue, and red striped dial. It sold for about $48,000 USD. A beautiful 1964 Rolex stainless steel Oysterdate ref. 6694 wrist watch recently surfaced with a beautiful and patriotic red, white, and blue strap. Measuring about 34mm in size, the Oysterdate ref. 6694 features a stunning blue dial and a smooth stainless steel bezel. The unique date aperture is located by the 3 o’clock mark. This vintage timepiece features a manual wind movement held by a waterproof stainless steel Oyster case with a screw down crown. The patriotic band is a new Nato Nylon Strap, prefect for everyday or formal wear.